Treat yourself to a new look with our brand new jewelled nose studs. We have two new nose stud designs that will light up your look. Both styles are specially designed to be comfortable to insert and wear. They are easy to insert, stay in place and feel great in your piercing. Here at BJS we an amazing selection of jewelled nose studs, from classic silver studs to funky colours and unique designs. These nose studs are made from high quality surgical steel and have a right angled shape. 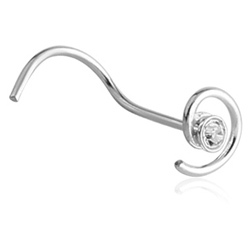 The shape makes them easy to insert and very comfortable to wear – especially if you have had difficulty with curved nose studs in the past. The surgical steel is non-irritating and easy to clean, so they feel great to wear. These studs come in a great choice of colours. They catch the light with beautiful sparkle, but are still understated. The perfect jewelled nose stud for every day. 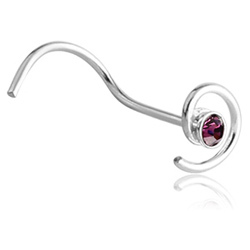 For elegant sparkle, take a look at our new spiral jewelled nose studs. These nose studs are made from polished silver and have a unique shine. They feature a delicate spiral set with a jewel. The result is that they look glamorous but elegant, perfect for showing off your piercing. 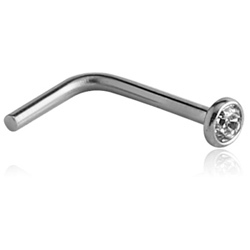 Silver is not recommended for wear in unhealed piercings, so you should wait for your nose piercing to heal completely before wearing one of these studs. This entry was posted in Nose Jewellery and tagged Jewelled Nose Studs, Nose Piercings, nose stud, nose studs, Right Angle Nose Studs, Surgical Steel Nose Studs on April 2, 2014 by Piercing Guru.